Gerald M. Ackerman, The Life and Work of Jean-Léon Gérôme, with a Catalogue Raisonné, London & New York, 1986, no.172, ill., described as ‘Lost’; Gerald M. Ackerman, Jean-Léon Gérôme, monographie révisée, catalogue raisonné mis à jour, Courbevoie, 2000. In the late 1860s, Gérôme painted a small group of remarkable pictures showing Napoleon during the Egyptian campaign of 1798-9, which are among his most compelling images. He was to return to the same theme in the 1880s and in his sculpture of the 1890s, an indication of how much importance he attached to it. Almost exactly a century had passed since Napoleon’s birth in 1769, but his life and times – in retrospect, a glorious period in French history – had become the stuff of legend. Gérôme profoundly admired Napoleon and must have realised that he was uniquely placed to depict this particular phase of Napoleon’s career; he was already famous for his Egyptian genre subjects and landscapes, derived from extensive travel in the region from the mid-1850s onwards. Gérôme’s Napoleonic subjects evoke the notion of destiny; in each of the paintings, Napoleon is shown deep in thought, a striking contrast to conventional military subject paintings depicting specific incidents in a campaign, or heroism in the heat of battle. In Napoleon in Cairo (Princeton University Art Museum), the young general is shown on his own, set apart from his waiting groom, deep in contemplation. Oedipus, exhibited at the Salon of 1886, imaginatively sets Napoleon in silent dialogue with the sphinx, the young man of destiny confronted by the enigmatic gaze of a monument thousands of years old; intriguingly, this painting and its pendant, Bonaparte at Cairo, were to be bought by William Randolph Hearst in 1898. Napoleon and his General Staff in Egypt is compositionally the most ambitious of Gérôme’s Napoleonic subjects of the 1860’s, and by far the most atmospheric. Here we can be in no doubt of the extreme conditions faced by Napoleon and his army during their short and ill-fated Egyptian campaign. 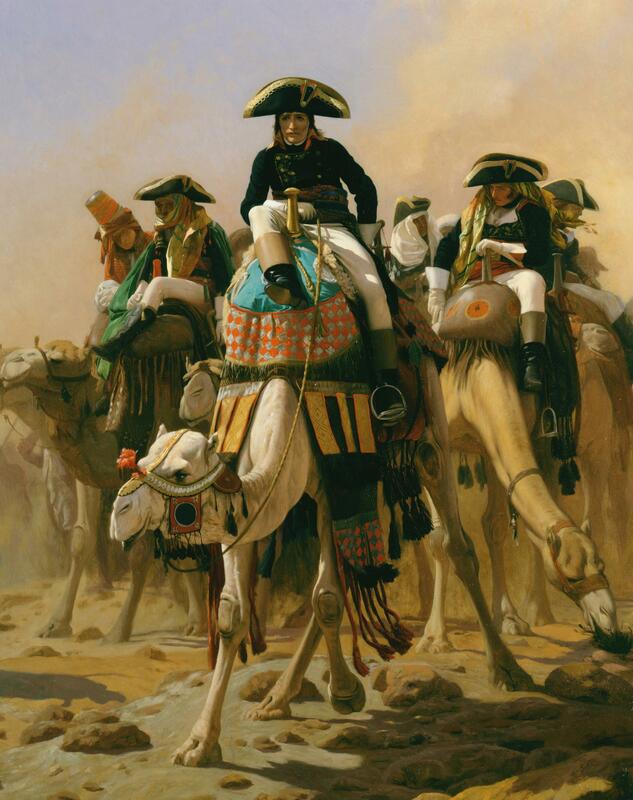 Gérôme’s friend Frédéric Masson, who had travelled with him in Egypt and was to become a respected biographer of Napoleon, described this painting, noting ‘the hot breath of the wind...the heat and the burning sand which blinds the officers of his staff...the golden mist raised by the Khamsinn...the frightful lassitude which takes possession of the best trained men save those who have compelled the body to be the docile slave of the mind.’ For Masson, this is not primarily a realist history painting, superbly executed as it is; it is about a state of mind. We are meant to recognise only one figure, that of Napoleon, who commands the composition, as he considers his future course of action: ‘He hesitates between the two halves of the world which he holds in his hands; he ponders upon the fate of Alexander, of Caesar...unconscious of suffering, his dream embraces the universe!’. 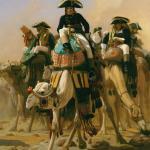 Only Napoleon is capable of ignoring the horrors of the desert as he contemplates his destiny. Is the viewer intended to understand this painting as representing a specific episode in the Egyptian campaign? By the 1860s, numerous memoirs by Napoleon’s closest aides had been published, as had his own correspondence, so that Gérôme would have been able to read first-hand accounts. Among the most vivid and reliable descriptions of the campaign was that by Napoleon’s secretary, Louis Antoine Fauvelet de Bourrienne, whose memoirs were published in 1831. By far the worst episode was the army’s retreat from Acre in late May 1799, following the fruitless siege of the fortress, where the French were outmanoeuvred by an alliance between Djezzar Pasha, the Ottoman military governor, and the British under Sir Sidney Smith; Napoleon had lost four thousand men, a third of the total force that had set out from Cairo, and had 1200 wounded soldiers. The French army was effectively defeated by a terrain for which it was unprepared. The retreat across the desert was terrible, as Bourrienne described: ‘An all-consuming thirst, the total lack of water, the overwhelming heat, the tiring march through the burning sand dunes, made the men lose all sense of compassion, so that they succumbed to the most cruel selfishness...I saw them throw men off their stretchers, officers who had amputated limbs whom they were ordered to carry, who had even given them money for their troubles....The sun, in all its power in the clear sky, was obscured by the smoke of the fires we had set to lay waste. Behind us the desert that we had made, before us the privations and the sufferings that awaited us’. It is very probable that Gérôme’s painting represents this episode in the campaign. There could hardly be a more dramatic or telling expression of the collision between two cultures than Gérôme presents here. The incongruity of Napoleon and his officers in their uncompromisingly western uniforms, struggling on camelback through the desert, is perfectly depicted. As Frédéric Masson observed, Gérôme’s mastery in evoking the clouds of fine, suffocating sand is remarkable. While the oil sketch (Hermitage, St Petersburg) established the essential structure of the composition, it is only in the finished picture that one can appreciate the subtlety with which he contrasts the searing sun that beats down on Napoleon and his mount, with the clouds of drifting dust stirred by the soldiers and their steeds as they march across the desert. Gérôme attached considerable importance to meticulous sketching and note-taking of every detail, whether of landscape, exotic costume, or animals. Théophile Gautier had noted in 1859 that this extended to endless drawings of camels from every angle! Over the years, he built up a vast stock of studies that formed an invaluable resource. In addition, he brought back all sorts of exotic items to use as studio props; the inventory taken after his death listed 10 oriental saddles – such as that on Napoleon’s white camel – as well as 173 costumes. Gérôme also owned various items of Napoleonic memorabilia, including two of his great black hats, one of which he made the subject of a late painting c.1900-4 (Musée Thiers, Paris) that he very appropriately gave to Frédéric Masson, Napoleon’s biographer. The oil sketch in the Hermitage is dated 1863; the finished picture is undated, but is generally thought to have been painted around 1867, the date when Adolphe Goupil first sold it to an American collector, Henry Probasco of Cincinnati. In 1863, Gérôme had married Goupil’s daughter Marie, and from this time, Goupil generally handled all his sales, developing his American clientele very astutely. In due course, Goupil was succeeded by his former American partner, Knoedler. Gérôme’s reputation in America was further enhanced by Goupil’s understanding of the importance of selling high-quality prints, generally photogravures, after his paintings. So well-known did his name become that many young American art students wanted to study with him; by the 1870s, he had a very large class in his atelier, over 100 students, of whom at least 60 were Americans. If Napoleon and his General Staff was painted in 1867 then it is just possible that a young American student might have seen it on Gérôme’s easel – Thomas Eakins.